I recently had the pleasure of visiting two museums whose collections include computers and computer-related exhibits. The first, the National Museum of Scotland in Edinburgh, has recently reopened its Science & Technology galleries following a £14.1 million redevelopment programme. The suite of six new galleries are considered to be the UK’s most comprehensive outside London and feature objects covering over 250 years of enquiry and innovation. 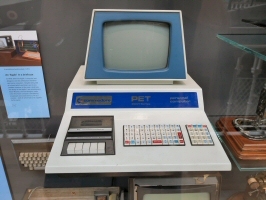 Computers on display include a Commodore PET 2001 (pictured below), one of the ‘1977 Trinity’ of early microcomputers and the first desktop computer I ever used. The collection also includes a rare example of an Apple-1. The Apple-1 model was originally sold without a case so the owner of this particular example built it into a leather briefcase in order to provide a suitable protective housing for the computer, echoing subsequent developments in portable computing. Also featured are several early portable computers including a GRiD Compass, the first computer to feature the now familiar ‘clamshell’ design. A few weeks after my visit to Edinburgh, I had the opportunity to visit London’s Design Museum. Billed as “the world’s leading museum devoted to contemporary design in every form“, the Design Museum has recently relocated to a stunning new building in Kensington High Street. However, despite having a huge amount of display space available, the permanent collection is disappointingly small. Computers are reasonably well represented but the labelling of items is rather confusing and I did notice what appeared to be a mislabeled Friden EC-132 Electronic Calculator. Although I am Scottish, I don’t think I’m being biased by stating that I preferred the displays in Edinburgh to those in London. This entry was posted in Uncategorized and tagged Apple-1, Commodore PET on 29/05/2017 by Stephen J Marshall.